Are you someone who travels or has a profound interest in travelling. Well, this post is for you. Needless to say, Emirates Airline has done it again. 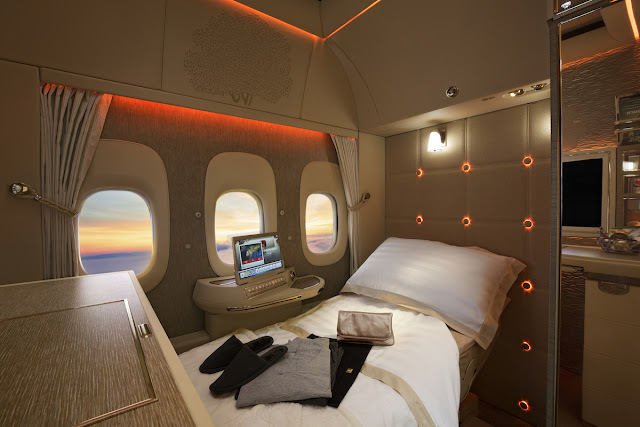 For those who are not aware Emirates Airline unveiled their new first class product on the Boeing 777-300ER on it's first day of the Dubai Airshow 2017. The have gone beyond any of their competitors could have, to state that their product is pure luxury is an understatement. 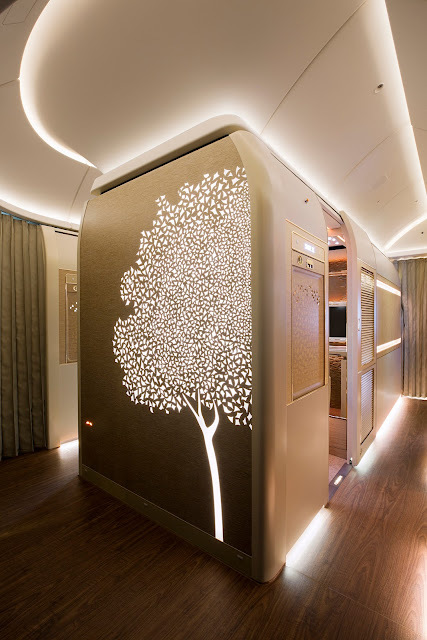 Emirates has always been very innovative and forward thinking making it stand ahead of the rest. Their first class is very well known as we have all seen the rich and famous sitting in their own little first class golden suites but let me tell you they have gone beyond commercial airline expectations, forget about what studies and regulatory bodies they had to work with to ensure safety standards were strictly adhered to. Emirates Airline prides itself not only on great customer service and innovation but also safety. 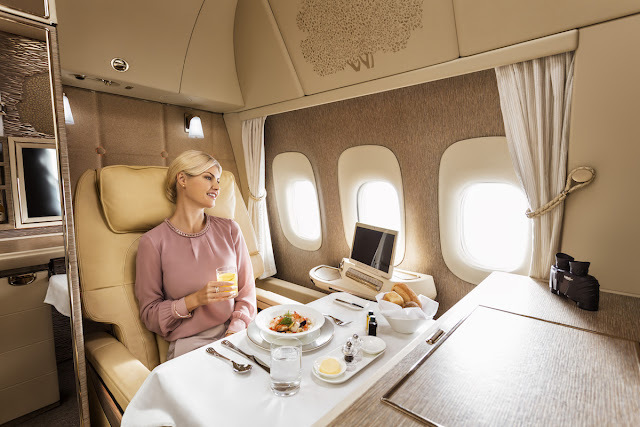 Due to the increasing space that was required for the first class individual suites, instead of their usual 8 seats availability they now accomodate 6. The interior design was done in collaboration with Mercedes-Benz and other prestigious entities. They contain two window suites and a middle suite on each of the two rows. The big question on everyones mind is, will the middle passenger be basically stuck in a closed viewless seat? Absolutely not, Emirates has gone as far as making sure it contains virtual windows from which you will get an outside view in realtime. We are now looking at fully private suites with a floor to ceiling door as a separator. The space is of 40 feet and the design is in line with the champagne, soft grey colour scheme Mercedes-Benz features in their S-Class Range. A full reclining seat which is used as a bed to get that much needed first class rest is featured together with a zero-gravity feature inspired by NASAs technological advances ensuring a weightless relaxation. As for the rest of the features, you will yet again have access to your own mini bar and inflight 32 inch award winning entertainment system. The luxe experience does not end here as you will be provided with the Hydra Active moisturising pijamas, Bvlgari cosmetic kits, Byredo skincare collection and Bowers & Wilkins noise-cancelling headphones. 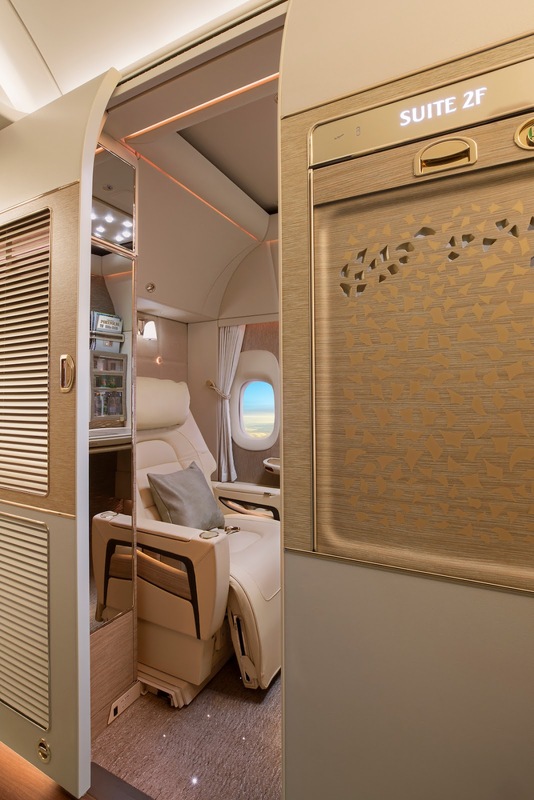 Everything you would require for a comfortable high class flight. But are you truly getting privacy? Oh yes, you may contact the cabin crew via a video call function and should you not wish to be disturbed, a service window is available so that you may still receive whatever you may request. Can you just image how great this feature is for high profile individuals? They can official get a higher extent of privacy. The only issue that may become apparent is that it is designed for a single person rather than those who travel together but then again if you think about it you can opt to fly A380 in that instance if it's a factor that is of importance to you. Plans show that by 2019, nine 777-300ERs will display this new cabin layout on destinations such as Brussels and Geneva initially and subsequently expanding to Chicago, Perth and Brisbane. Tim Clark, the Emirates Airline President did state that eventually this feature will be available throughout the whole fleet, however such a great change obviously needs time to ensure the high standards expected. From the 1st of December 2017 you may be able to experience this feature on your way to Geneva or Brussels. 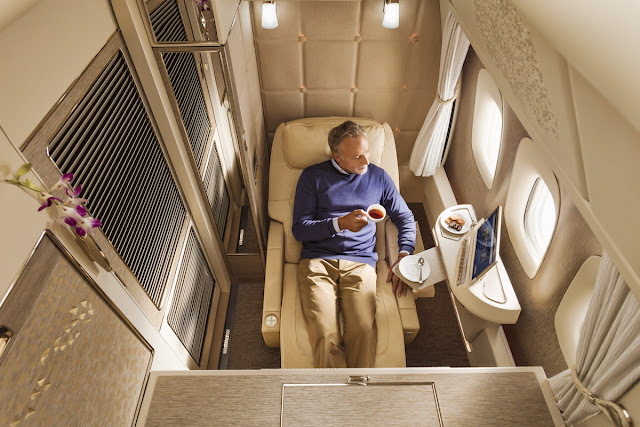 You would think the experience ends here, but if you are new to emirates let me tell you it DOES NOT END HERE. Courtesy of the full experience an S-Class Mercedes Benz will available as part of their inclusive chauffeur service when you fly in the United Arab Emirates. Want to see it in a video? Emirates Airlines never fails to surprise us all. All hail, Emirates Airline. Emirates is one of the best. Great airline. Thank you for stopping by. Great post that first class looks out of this world. Wish I could experience it.